Knitting on the plane, I had some great conversation with my row mates. I kept the project small so that I didn’t annoy them too much with flying yarn. We got a shuttle to my brother and sister-in-law’s home, but of course there was some waiting and no air movement in the parking garage at SeaTac. At this point I had moved from mug cozies to hats. 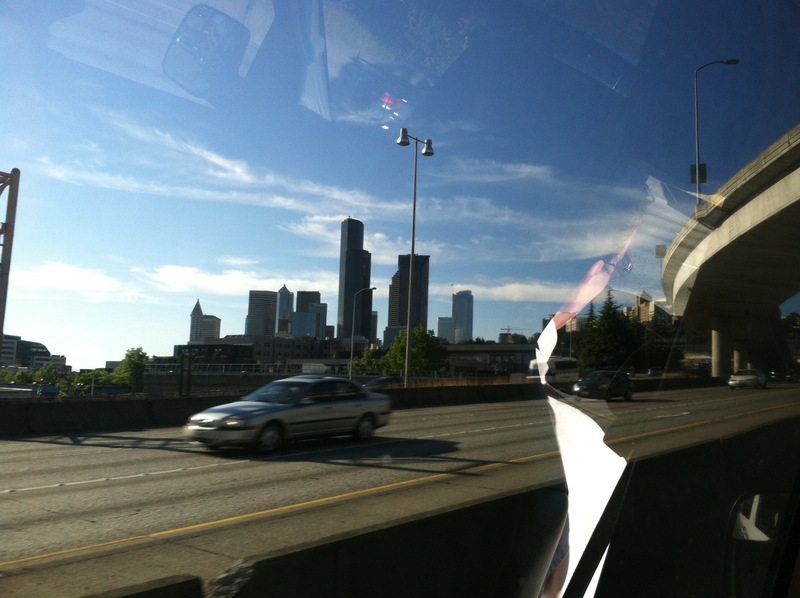 Seattle is such a beautiful city. I really do love it and miss it, but I don’t miss the driving, the shuttle was great we chatted with a mom and daughter on their way home, they were fighting jet lag the whole time. Ok so this is our sunset picture but we are facing the sun, so yeah It was really pretty. This was at the retirement party for my dad, 37+ years with the National Park Service. It was a great way to grow up. Super Scary Road, that isn’t the official name but I named it that while my dad was driving. 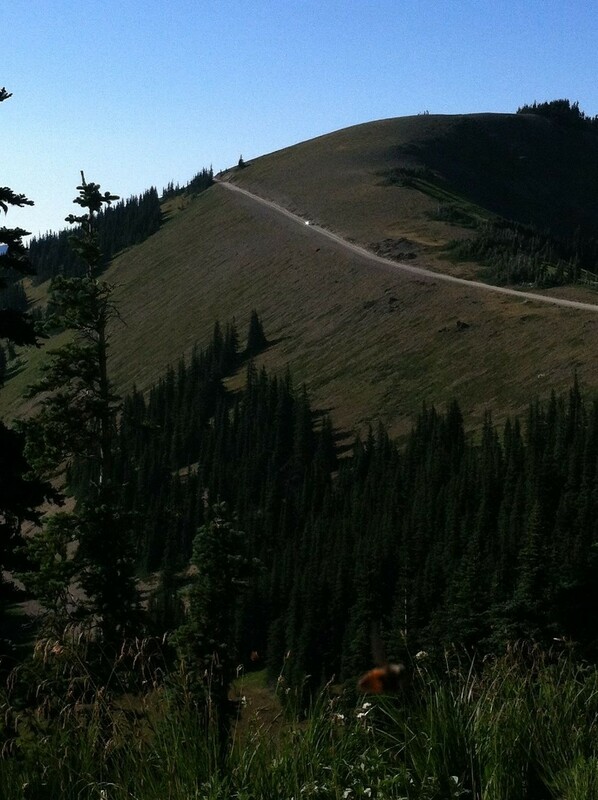 We are headed to Obstruction Point in Olympic National Park. The super scary road led to some pretty spectacular views. These are the Olympic Mountains, the tall one in the center is Mount Olympus and I grew up on the other side in the Hoh Valley. 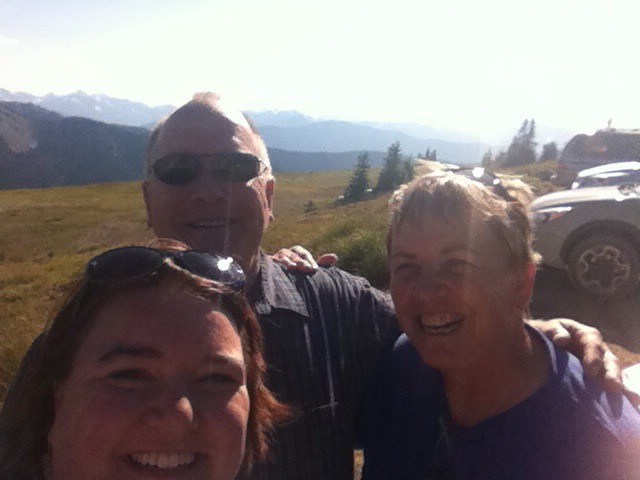 My dad, aunt and I attempted to get a selfie with the mountains in the background, I’ll settle for alpine meadows. 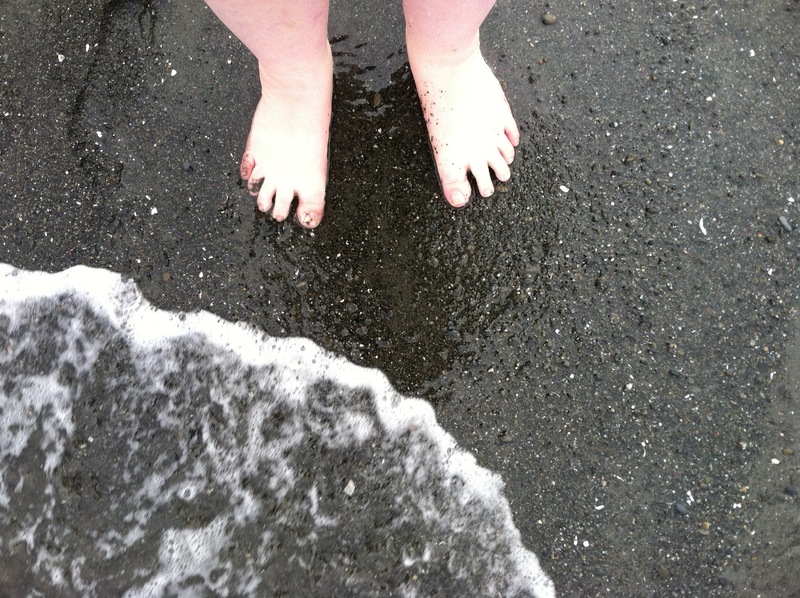 So cold but the Pacific is my ocean. Zach says it is angrier than the Atlantic which leads to some great adventures and less people. 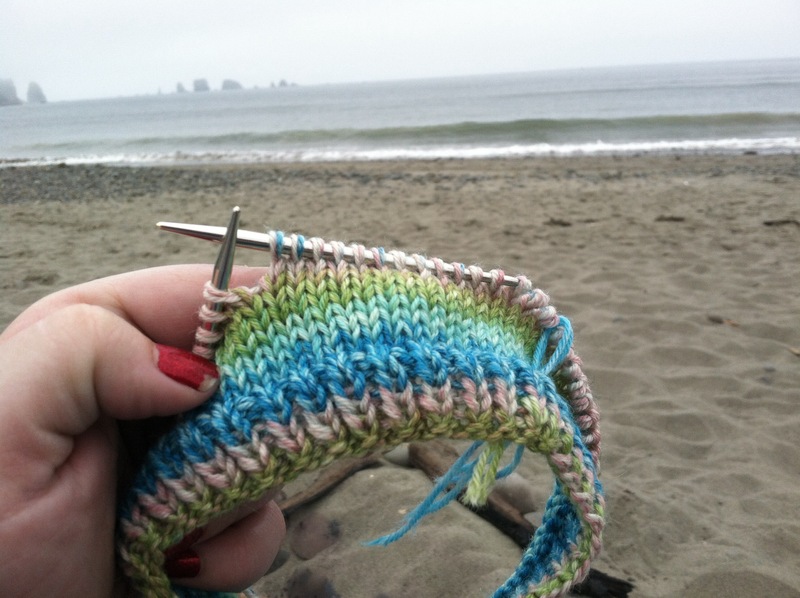 Knitting at La Push yep that La Push. We spent a couple hours here and had lunch at the restaurant in the village. It was a busy day at the beach, tons of walkers and a couple surfers. Some days you are the only person in sight, my kind of beach, and I get to wear a sweatshirt. 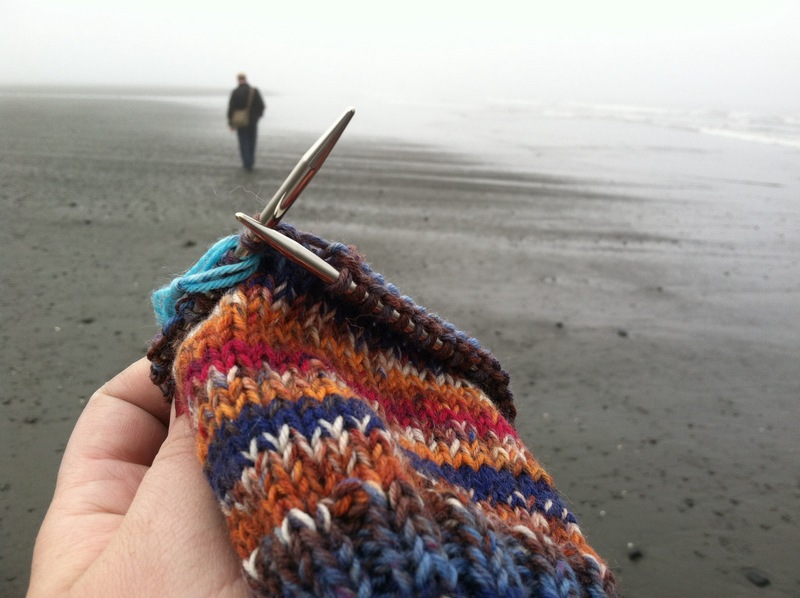 We also went to Kalaloch and I of course brought some knitting. 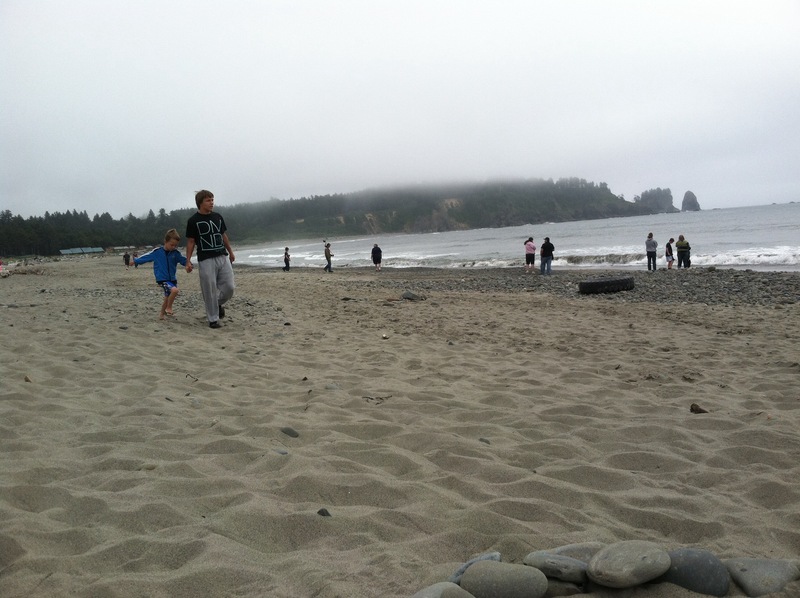 Zach went beach combing but there was no way that my still recovering ankle/foot would be able to handle all the sand. I also got some knitting done while watching some baseball with my dad at my childhood home in Forks, Wa. There’s no place like home. The morning we were headed back to Seattle we took the time to go on a float trip with one of my brothers as the guide. We only got stuck a couple of times and didn’t have to bail out. 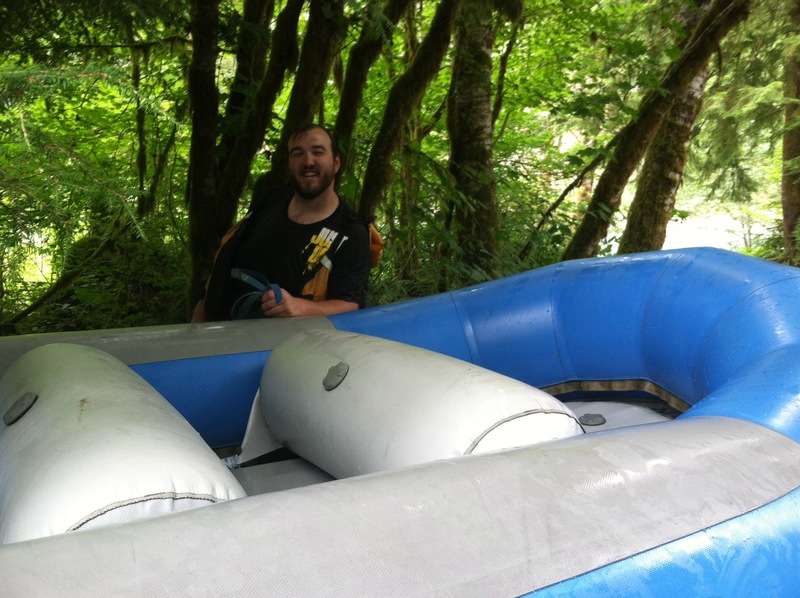 I did forget to get a pic of me knitting in the raft for fun. I was too busy paddling to actually knit. While waiting for the Ferry in Edmonds my dad was so bored that he picked up my mom’s knitting magazine and starting to try and understand it. He got to the Q&A sections and didn’t understand any of the knitting language and didn’t believe that my mom and I did. 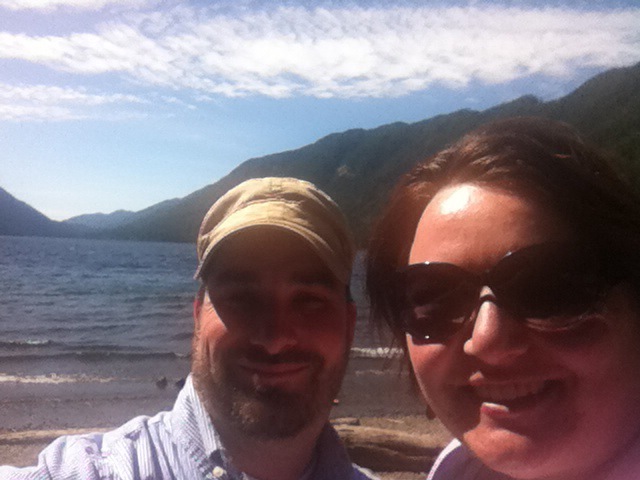 We stopped for a photo op around Lake Crescent, very deep, very cold, and very pretty. This is Forks High School and while I did graduate from FHS I did not attend in this building. They have rebuilt the entire thing and doesn’t it look good, best of all it doesn’t flood. Our view on the final ferry ride the evening before we flew back to Pennsylvania. Nothing can beat this view. What a great trip. I like all of your fiber pics. Sounds like an amazing trip with lots of knitting time. So much knitting time. I forgot to take some pics of my mom and I knitting on her bed, our favorite spot.